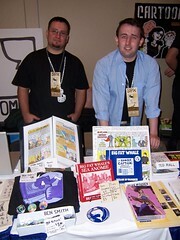 Photo fun from our book-signing and SPX appearances! For more, see the whole gallery. Thanks to links from Counterpunch and WhatReallyHappened, I had more than 5,000 unique vistors today, an all-time high. Wow. P.S. Sorry for the dorky headline, but the Dow Jones Industrial Average hit an all-time high this week, so, er... nevermind. I almost drew (and may still draw if this scandal has legs) a cartoon about how the GOP has tried the old "blame-the-gays" trick on two fronts: (1) claiming that they didn't want to expose Foley's behaviour for fear of being accused of gay-bashing (oh please) and (2) all that tolerance and diversity promoted by anti-war feminist gay liberals has created sexual predators. But in the end, I wanted to focus on even bigger scandals, like last week's horrific pro-torture legislation that takes away a detainee's right to challenge his/her imprisonment, otherwise known as the writ of habeas corpus. 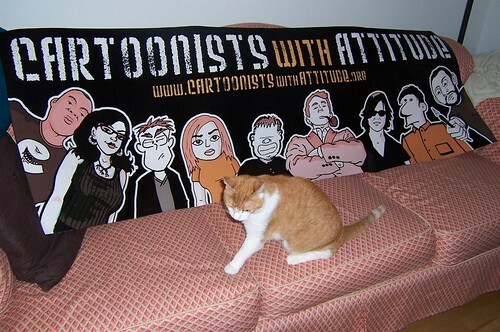 (See also new cartoons by Stephanie McMillan and David Rees). A few notes: "Rumstud" is a real nickname Bush uses for Rumsfeld. And just to make sure no actual IM users got harassed thanks to this cartoon, I either registered for all these names or made them too long to be real. So if you ever want to chat with Rumstud1984 or KingGeorgie101, I'm afraid you're out of luck. Also, 2,730 (in the dead soldier's name) was the number of American troops killed in Iraq as of this cartoon's writing. Here's a somewhat lighter cartoon for Chelsea Now. Sure the real-estate balloon/bubble/souffle is deflating, but home prices outpaced incomes for so long that now only the well-off can afford to buy in Manhattan (and most of Brooklyn). Mikhaela now in Chelsea Now! The cartoonist for the Villager has returned from a short sabbatical, but I'll still be doing NYC-area cartoons for brand-new community newspaper Chelsea Now. My skinny jeans cartoon ran in the first issue last week, and I'll have a new cartoon in this week's issue. The especially fun thing about this is that my first year in NYC I lived in a crowded (four women in a three-bedroom) fifth-floor walkup in a lovely Chelsea brownstone (oooh, exposed brick!) on 22nd Street, so now I get to cartoon about my old haunts. Mark Your Calendars, NYC and DC! 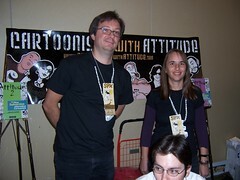 DC: Oct. 12, 7 p.m..
CARTOONISTS WITH ATTITUDE BOOK SIGNING AT POLITICS & PROSE. At Politics & Prose bookstore, 5015 Connecticut Avenue NW, Washington DC 20008. 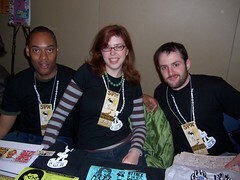 Tabling with select members of Cartoonists with Attitude (see above list). I will also appear on a panel, time TBD. At Marriott Bethesda North Hotel & Conference Center, 5701 Marinelli Road • North Bethesda, MD. Discussion and slideshow with Tania del Rio and Raina Telgemeier.